On such a special day, it’s important to take a step back and appreciate those important mothers in your life. Whether its your sister, daughter, mother, grandmother, friend or wife… they all are special and deserve their own unique Mother’s Day gifts. This is why we have come up with the perfect gifts for each and every one of the extraordinary mothers in your life. This present is about letting your sis know how important she is, and how wonderful of a mother she is! You want to show her how much you love her, and let her know that you see how great of a job she does as a mom. For all of you that have sisters who are moms, we suggest getting her a Classic Birthstone Mother’s Band! Simple, elegant, and the perfect mother ring for your sister. Your daughter is the most important person to you. Now, she’s become a mother of her own. Mother’s Day is the perfect opportunity to let her know how proud you are of her accomplishments, and of her motherhood. Show her how meaningful it is for you to have grandchildren, and how special her efforts as a mother. For your daughter whose also a mother, we think that a Heart Birthstone Mother’s Ring will tell her just how important she is! Sometimes we don’t spend enough time expressing how much we love mom. Mother’s Day is the day to really show her how much she is loved! It’s the perfect time to let her know how much you appreciate everything she does, and show her why she is the best mom you know. For your mom’s gift, you need something really unique and special. That is why we think the Double Layered Birthstone and Diamond Accent Ring is just the piece of jewelry for her. Beautifully personalized, individual and just as special as your mom is! Grandmothers are very special people. Wise and beautiful. There aren’t many days when you can devote yourself to showing your grandmother how important she is in your life, and the lives of those who love her. That’s why we think getting your grandmother a Birthstone Family Tree Necklace is so perfect for the occasion. Grandmothers pride themselves on their families. Why not show her how much she is loved by personalizing a necklace with the birthstones of all of her children and grandchildren. It will be a truly meaningful and amazing gift to give. It’s easy to see the love that your friend has for her children. You are there through all of those meaningful stories she shares with you about her family and her kids. This is a very special day for someone very close to you. Why not surprise your friend with a present on Mother’s Day. Show her how all of her stories and conversations about being a mom have impacted your own life, and give her something she’ll always remember. We think that the Elongated Mother’s Birthstone Band is the perfect gift. You can customize this ring to represent her children’s birthdays and names. This special ring will be the most memorable gift you can give. Mother’s Day is the best time to show how important your wife is to you. To show her that you appreciate and notice all of her hard work. To show her how much you love her and how important she is in your life. It’s a great opportunity to go above and beyond and get her something special that she will cherish and love forever. We know just the gift to give. The Square Birthstone and Diamond Family Ring is just the jewelry you’ve been looking for. A spot for her birthstone, a spot for your birthstone, and two special engravings that stay together forever. This will be the most meaningful gift she can receive, and she’ll just love you for it! Mother’s Day comes once a year. Spend this time with her to make her feel special, important and show her how much you just love her! Gifts are special, but the time you share together will be priceless. Happy Mother’s Day! Chocolate. Flowers. Jewelry. I think everyone knows that some combination of any of these would make a good valentine’s day gift. Its completely fine to stick to the traditional gifts, however, it will be even more appreciated if you try and find some new variation on these classics. Your goal should be to create a memorable experience for your loved one, instead of just another bouquet of roses and a box of chocolates. When it comes to Flowers it is a bit more difficult to be creative. This year instead of simply giving her a bouquet of roses try and spice it up and get creative. There are a number of ways to do so. One is to buy more exotic flowers like the Blood Lily, Blue Dawn Flower, or the Calatheas. All of which are very beautiful and very exotic. A nice vase is also a good touch. Finally, Jewelry is always a difficult thing to buy for your loved one. The key is to avoid potentially buying the wrong thing. To do so consider buying an engraved couple’s ring. This will not only show her that you had been thinking about this day for a long time, but it is also extremely personal and difficult to dislike. I came across a number of these rings on www.jewlr.com. This valentine’s day do something different and make her happy. Diamonds are such an easy choice when deciding on jewelry. It’s classic, it always looks good, and it’s almost always the stone being advertised. But aren’t we forgetting some of the most beautiful stones available? What happened to those beautiful rubies, glowing amethysts and dazzling sapphires … just to name a few. These colourful palettes of striking gemstones are often overlooked but should be reconsidered because they make perfect presents! Giving a personalized gift with a unique stone that is completely attuned to a special someone is so meaningful. Birthdays are one-of-a-kind. It’s about time we celebrate the inimitability of those we love most by cherishing them with something special! But these stones are great gifts for any special day! New mothers love to treasure the birth of their child with birthstone jewelry. Grandmothers can keep their family close to her heart at all times with a necklace that showcases the birthstones of all her children and grandchildren. Couples can embrace and cherish the love they share with a matching birthstone couples ring. We love birthstone jewelry for every occasion! Birthstone jewelry is amazing because of the large range of styles and prices. Online stores tend to have a wide selection to help you pick the perfect piece, which is perfectly personalized for you. 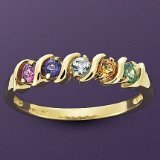 We’ve found that Jewlr.com has a huge assortment of rings, necklaces, and bracelets that can be customized to express individuality and unique birth months. Their personalized pieces make the perfect presents for mothers, daughters, sons, grandchildren, grandparents or husbands and wives. Are you looking for pieces of jewelry to add some sparkle to your December? For this month, we think you should try out some jewelry with gorgeous December Zircon! Zircon ranges in so many different shades and hues of blue, from a very light white colour to beautiful icy blues. These stones go beautifully with the natural colours of December, and will brighten up your everyday outfits! Give it a try!! !